which is why when we were approached by Monitiq to help them develop a new identity and website for their unique product we were so excited. When it comes to mission critical creative Parkhouse Evans deliver. 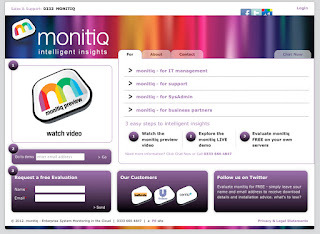 The Monitiq site has been designed to be easy to use and simple to navigate. In addition to this it will also have a ThatsThat editable interface which will allow Monitiq to securely update the content and add special effects such as image rotators, promotions and various feeds. The site will undergo various modifications over the next few months too - which will ensure it is current and relevant to Monitiq customers, partners and prospects.